Stuff the silly stories about Lion-boy, Blondel is superb. The tune was re-used in the Carmina Burana and by Gautier de Coincy. The Victoria and Albert Museum has just finished an exhibition on Opus Anglicanum: the website is worth a look, costume and fabric-wise! A review from The Spectator. Sad to note that Jonathan Riley-Smith died a little while ago. However, there is a new biography out of Steven Runciman, Outlandish Knight, by Minoo Dinshaw. The famous Beaton portrait of him with his parakeet Benedict is on the cover. I met Runciman briefly in his later years, when he lectured to the Scottish Hellenic Society in St Andrews: he was honorary President of the History Society at St Andrews, and bequeathed the university his library. I think he'd dialled down his campness for the occasion, unfortunately. His real failing as a historian was his preference for romance over accurate handling of sources. Gorgeous 'new' 15C book on Outremer! If you are a connoisseur of beautiful books, Taschen are the publishers to go to... Now they've done something Outremer-friendly! I picked up this gem in the university bookshop while sheltering from the rain at lunchtime: Sébastien Mamerot: A Chronicle of the Crusades. It's a translation of a 1470s history of Outremer, with the original MS illustrations. So if you want to see all the usual suspects looking as if they've wandered in from the Wars of the Roses, this is where to go! The plates are gorgeous! And, being Taschen, it's affordable! As so often happens with an exhibition close by that you can visit any time you feel like it, I only finally caught this a few days before it closed. So, apologies to anyone who might have been inspired by a more timely review to sprint to the BM to see it for themselves! The Guardian's reviewer raved about it, and certainly the prehistory and classical section of the exhibition was wonderful - the Sicilians had lent some wonderful artefacts, and they were beautifully laid out and interpreted (with the assistance of some glorious full-wall-sized photographs of Sicily's classical sites landscapes, that you felt you could walk into). But the Norman section was just a bit of an anticlimax, because the bulk of the really stunning artefacts from that period can't travel. There were photographs of Roger II's palace at Palermo, including a marvellous one of the ceiling of the Palatine Chapel, printed as a huge transparency and mounted on the ceiling, with benches so you could sit and gaze up at it; that was good, but it's a poor look-out when the photographs are better than the original artefacts. And there was one crushing disappointment; I came round a corner and thought 'Cripes! Have they really managed to borrow Roger's coronation mantle from Vienna???' But on coming closer: 'Er, no, they haven't; this is a rather crude copy in lurex cord on what looks like cotton.' That was a real let-down. So, although there were certainly some lovely artefacts (and the catalogue is definitely worth a riffle, and indeed a purchase especially if you can find it at cut price), there's no need for Oltramarines who missed it to shed too many hot tears. New website for the updated Regesta regni Hierosolymitani! This will be fun to play with...! The Notitia Dignitatum has some fascinating proto-heraldry (late 4-early 5C CE) in the form of military shield designs, with different units having their own devices. There's a great website on it here. I discovered it via the Osprey books on the late Roman and Romano-Byzantine armies. 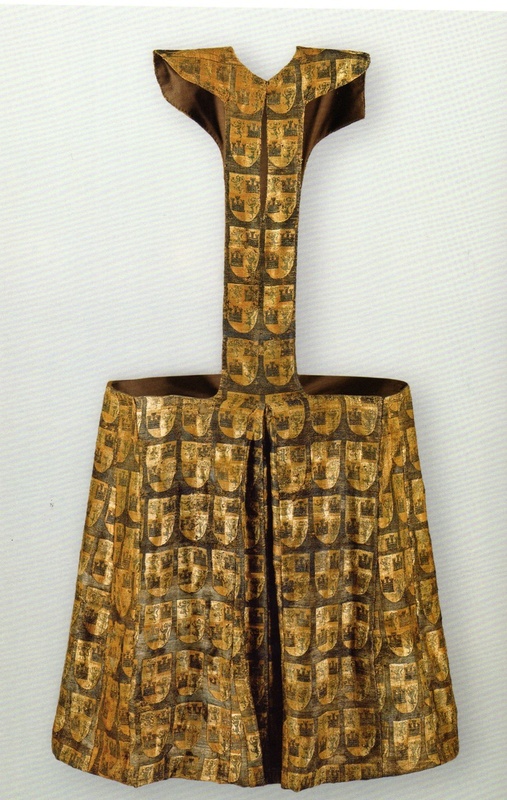 It's interesting to see the roots of armorial devices in the very early Middle Ages. I recommend downloading the Paris and Munich editions! WTF? I mean, seriously.... WTF?! I recommend Michael R Evans' Inventing Eleanor: the Medieval and Post-Medieval Image of Eleanor of Aquitaine (Bloomsbury, 2014). It highlights how little we really know: how many assumptions are in fact rooted in myth-making and competing 19C nationalisms/regionalisms. It's given me a lot to chew on in terms of thinking of my own work on Conrad, navigating the embellishments imposed upon the comparatively patchy chronicle and documentary records. The interesting element here is the analysis of Agnes of Germany: as Conrad's maternal grandmother, she is the source of his MtDNA, via her mother-line (daughter of Berta of Savoy, daughter of Adelasia of Susa, daughter of Berta degli Obertenghi of Ivrea, who d. 1037).These women's haplogroup is R0, which is more common in the Middle East, but not unknown in Italy. I just stumbled on the medieval illumination blog of the British Library, which is an absolute delight; it's where the BL's medieval manuscript specialist let their hair down and post about their favourite illustrations. It distracted me for hours, and certainly will again. Among other things, in an entry about insects in illumination, there's a splendidly jolly picture from a (probably Picard) manuscript dated 1232-1261 (so within living memory of the event, just about) of Reynald of Chatillon staking Patriarch Aimery out smeared with honey. The whole blog comes hugely recommended! About 60 Russian and Israeli re-enactors have re-enacted the battle of Hattin on the original site, on the anniversary. Bravo them! If you've got silly money, like €650 a night. Found this 2013 Dolce & Gabbana show. Have a browse through the pictures. I love the use of the mosaic patterns. Roger and co are recognisable! There are some excellent examples of 13C clothing preserved in the Museo de Telas Medievales, at the Convent of Las Huelgas in Burgos. and website here. The heraldic hat may be familiar to viewers of the 1961 film El Cid, which, though set in the 11C, was based heavily on later mediæval romances (not to mention Fascist propaganda to facilitate filming on location) and costumed more in keeping with them. I love this heraldic sideless surcoat! Rare and ancient manuscripts deliberately burned in Mosul. Meg Clothier read classics at Cambridge, worked in Moscow for Reuters, then came back to Britain to study for a master's degree in post-Soviet politics. While writing a paper on Georgia she read about the 12th-century Queen Tamar of Georgia, and (in her own words) "an inner voice whispered 'Sod the PhD. She’s worth a novel'". 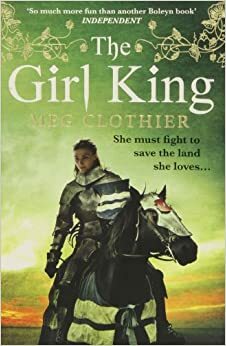 All of which made me want to like The Girl King very much indeed, and hope that it would be brilliant. Sadly, I can only give it B+ for effort and good intentions. I was going to write a long review but I find that someone else has already said much of what I wanted to say and a good deal more, here. I'd only add in Clothier's favour that when she sticks to politics and statesmanship, she's good; I wish she had jettisoned most of the romance and stuck to the nuts and bolts of being a 12th-century queen. (And one cheer at least for making her not only quite unappalled by blindings, castrations and royal hunts consisting of mass slaughter of trapped animals, but having (almost) no truck with 'How can I marry a man I do not lerve???' either.) She also sternly set her face against 'exotic colour', perhaps even too much - you don't get much feel for how Georgia and its people looked. The real failure in it is the Young Lerve element, which is not only, to my taste, quite unnecessary but just not even well done; she fails to make her Tamar 'n' Sos pairing interesting or particularly convincing. I have to declare an interest here; I've always had a huge admiration for Davit Soslani, whose achievement I think is unique in history; in a male-dominated warrior society, he spent his entire career as the (brave and mega-capable) subordinate of his wife, and still managed to go down in their country's history as a great warrior-hero and king. Anybody know of an achievement matching that? I don't. I'd love to meet that man, if only between the covers of a book, but I didn't meet him in The Girl King and am deeply, deeply disappointed. Another gripe; the notion that readers will warm to juvenile historical characters if their names are given snappy short pet-forms - Sos for Soslani, Zak for Zakari, Con for Constantine. This reader doesn't; it grates. And frankly, if you require your readers (as Clothier, to her credit, doesn't shrink from doing) to take in their stride a character with the surname Mkhargrdzeli, do we really need his given name shortened from Zakari to Zak in order to feel close to him? And this isn't Clothier's fault at all, but she has been dismally served by her publishers in the matter of cover art. 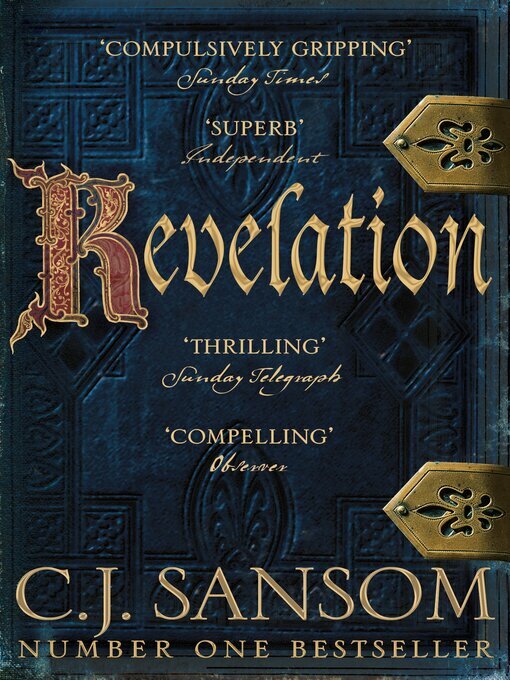 While Century's cover is just lettering that looks like something for a Tudor novel by S J Parris or C J Sansom, the Arrow Books one is crassly inappropriate. Clothier very rightly stresses in the book that Tamar never went into battle herself, but here we have a full-on Girl Knight in full 15th-century Western European armour - give her a white banner and that'd be a picture of Joan of Arc. It's a strong contender for this board's 'Rubbish Medieval Book Cover' prize. Still, Clothier does give a small part in the novel to everyone's favourite bad-but-fun Byzantine, Andronikos Komnenos; and he has a major role in her second book, The Empress, about Agnes of France who was sent to Constantinople in 1182 to marry Alexios II Komnenos. But, having just sent it to Silverwhistle for Christmas, I'll leave her to review that one!